In the wake of the Parkland school shooting, Florida Governor Rick Scott is proposing legislative changes in the hopes of preventing another tragedy. The biggest stunner from Scott’s late morning press conference was a controversial plan to raise the minimum age to purchase guns from 18 years old to 21. This was just part of a $450 million spending package that will focus on tightening up background checks, requiring longer waiting periods to purchase guns, temporarily suspending gun rights for anyone involuntarily committed for psychiatric observation, and requiring one armed law enforcement officer per 1,000 students at public schools. Fascinating that Scott is suddenly interested in addressing mental illness and gun ownership, considering the fact that he signed “Glocks vs. Docs” into law, limiting doctors from asking patients whether or not they own firearms back in 2011. A US appeals court struck down the NRA-backed bill in February 2017, citing a violation of a doctor’s first amendment rights. Going after people with mental illness—a demographic that is only responsible for three percent of violent crime—instead of denying access to high capacity semi-automatic weapons such as the AR-15—which caused carnage in Parkland, as well as in Newtown, San Bernardino, Las Vegas, and Sutherland Springs—shows that Scott likely won’t deviate too far from his post as a trusty shill for the NRA. Additionally, it’s also worth noting that after the Orlando Pulse Nightclub shooting in 2016, Scott didn’t propose any legislation to help keep Floridians safer. But he made sure to make vapid statements about “finding solutions.” I’m sure the families of the 49 victims found little solace in that. This political cowardice has led to a TV spot that’s floating around the Florida airwaves right now. Spearheaded by Democratic Rep. Gabby Giffords’s gun control advocacy group, the ad accuses Scott of putting NRA donations above his constituents. 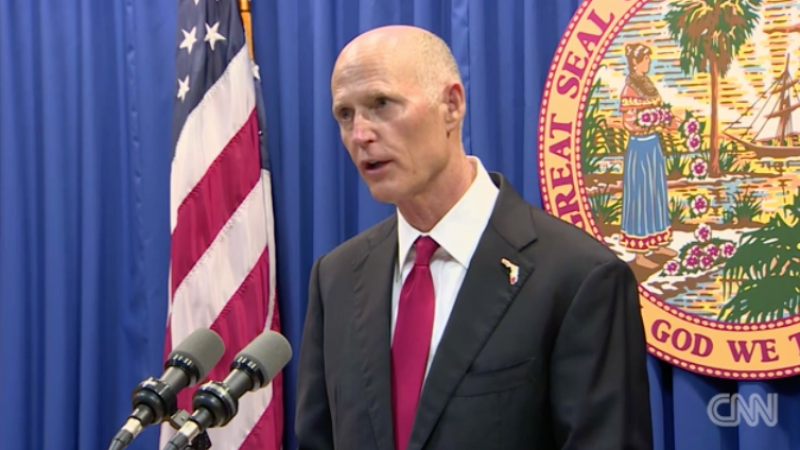 Scott’s plan does exclude a proposal that’s gaining vocal support on the right: Arming teachers. Instead, Scott wants to “let law enforcement do the keeping us safe and let teachers focus on teaching.” This move sets Scott apart from both President Trump and the National Rifle Association, the latter of which have blessed him with an A-plus rating. The NRA also opposes raising age limitations for firearm purchases, so it’ll be interesting to see whether or not Scott’s glowing rating will slip in the coming days. Or maybe they’ll be too enamored with Scott’s vision of an increasingly militarized school system and steady access to semi-automatic weapons to care.